Chicago, IL - If you have ever attended a choral festival on this continent, you probably heard at least one of his compositions. If you have ever attended a Divine Liturgy responded to by a choir, you have probably heard one of his arrangements during the service. Even if you attended liturgy responded to by a single chanter, they probably sang a traditional church hymn notated by Stevan Stojanovic Mokranjac, one of the most significant composers in Serbian history. 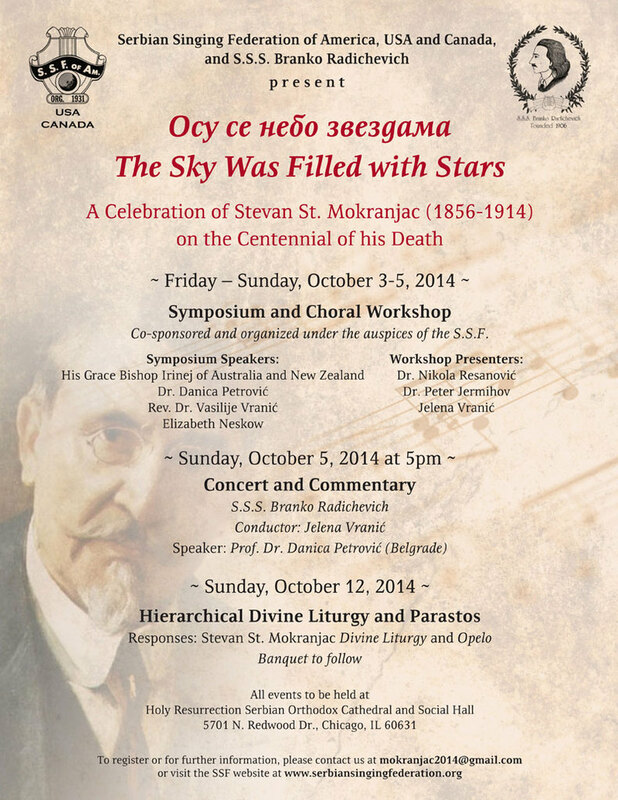 The Serbian Singing Society Branko Radichevich and the Serbian Singing Federation will commemorate the 100th anniversary of the death of Stevan Mokranjac this coming October 3rd through 5th and on the following Sunday, October 12th, 2014 in a three-part event entitled “Osu se nebo zvezdama/The Sky Was Filled with Stars.” October 3rd and 4th will consist of a symposium and choral workshop centered on Mokranjac compositions of sacred and secular folk music. A concert will take place at 5pm on Sunday October 5th and will feature a presentation by Prof. Dr. Danica Petrovic, musicologist from Belgrade, an expert in the life and work of Stevan Mokranjac. On the following Sunday the 12th, there will be a Hierarchical Divine Liturgy, followed by a Parastos (memorial service) in the composer’s memory. The S.S.S. Branko Radichevich will host a commemorative banquet featuring a short performance by the choir during the program. The choral workshop and symposium and concert will feature presentations by His Grace Bishop Irinej of Australia and New Zealand , Professor Dr. Danica Petrovic, Dr. Nikola Resanovich, Dr. Peter Jermihov, Rev. Dr. Vasilije Vranic, Elizabeth Neskow and Jelena Vranic. The Brankies are in intense rehearsals where they are polishing up Mokranjac music they already know, learning new folk compositions and liturgical hymns to prepare to sing all responses to the Liturgy and Opelo using Mokranjac arrangements only. A musically-centered Serbian event of this magnitude consisting of academic, musical and spiritual facets has never taken place on this continent until now. All events will be held at the Holy Resurrection Serbian Orthodox Cathedral in Chicago.